‘Tis the season for LOTS of list-making and organizing if you want to stay sane. Christmas is so hectic with shopping, events, decorating, and on-and-on. I’m all for anything that helps me stay in the moment to enjoy the holidays, and being organized does just that. When I don’t write things down, they are constantly bopping around my head nagging me at the most inopportune times. Like when I’m trying to sleep! Several years ago I started carrying around a Christmas shopping list with all our gift recipients to help me keep track of gift ideas and our budget. Before, I’d be rattling off names in my head trying to remember who we had already bought for, and who was left to shop for. 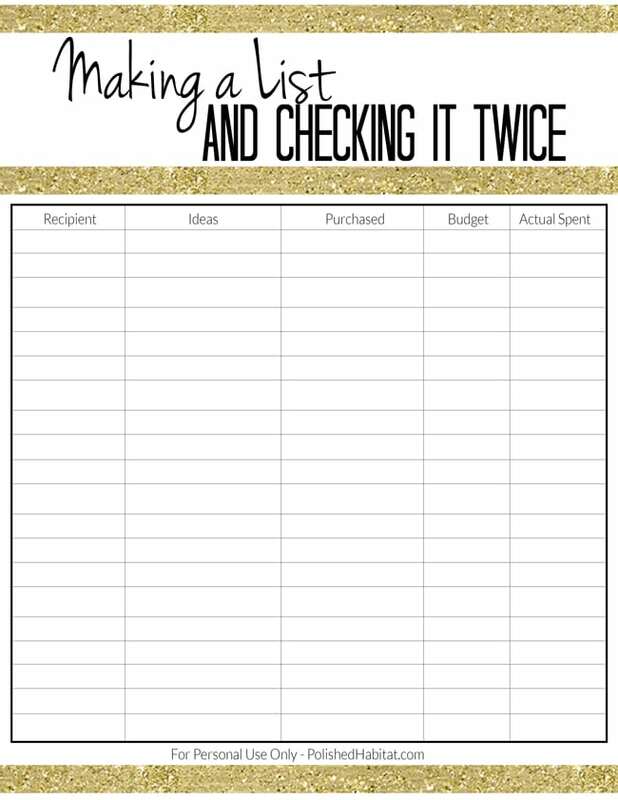 This year, I decided to upgrade from my normal piece of notebook paper to a pretty printable that I could share with all of you! I fold it into thirds so it fits easily in my purse and I can grab in during any impromptu shopping excursions. Click here or on the image below to open a printable image for yourself! It may take moment to load. I also teamed up with Angela from Blue i Style to solve another gifting dilemma. Do you ever buy things throughout the year for Christmas, birthdays, etc? Have you ever forgot that you had them? Or hidden a present and then forget to wrap it? Yep, it happens to the best of us! 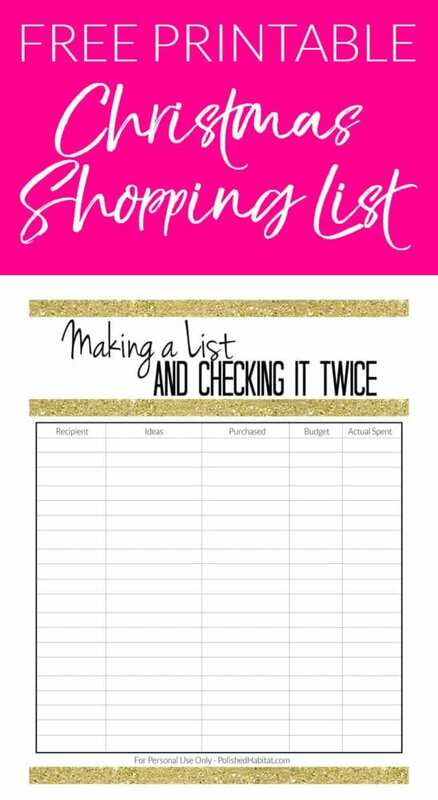 Angela created a free printable gift tracker that you can use to list all the gifts you’ve purchased. Once they are wrapped and gift tagged, mark them off your list! So simple and yet SO helpful! 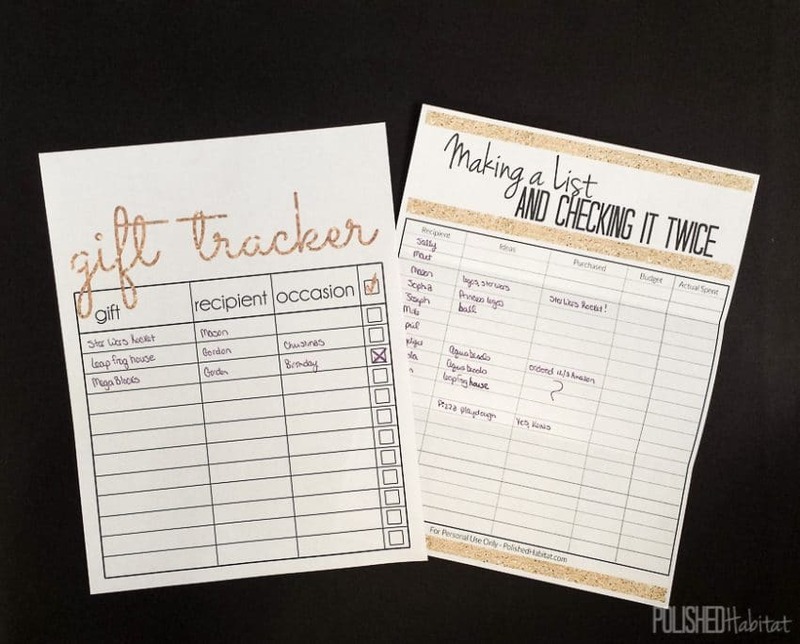 I’m loving that she included an occasion column because it makes the tracker functional all year long AND keeps me straight on what I’ve purchased for Christmas and what I’ve purchased for all the family birthday that hit right around Christmas. No more trying to keep it straight in my head! Click here on the image below to visit Blue i Style for the Gift Tracker! And here’s a handy image to pin so you remember where to find your printables every year. Add a column to the gift tracker to write in where you’ve hidden it. I’ve purchased items and then couldn’t remember where they were! THANK YOU, Melissa and Angela!! I needed these!!! I have a closet AND a chest of drawers where I stash inexpensive yet cool “finds” throughout the year to have on hand when I need a gift…yet often find myself opening a drawer and saying, “Oh, I forgot I had this!”…..you get the picture. Now, problem solved!!!! Happy Holidays!!!!!!! Such a great idea! Thanks so much! Thank you! These lists will definitely come in handy.